This year's infiorata is commemorating Valletta's 450th anniversary by depicting early plans of Valletta and its fortification. The Valletta Green Festival, an annual spring festival organised by the Valletta 2018 Foundation, was officially opened today Friday 6th May in St George’s Square and will continue throughout the weekend. 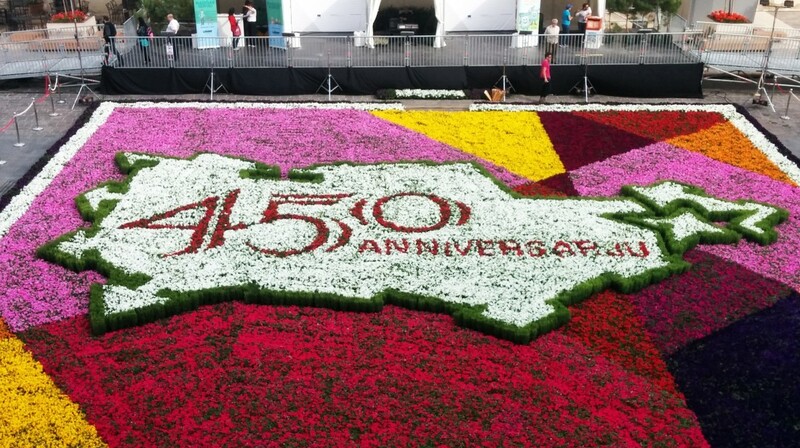 The Valletta Green Festival is taking place as part of a series of events organised by the Valletta 2018 Foundation, to mark Valletta’s 450th anniversary. Over 80,000 flowering plants reproduce the outline of one of the early plans of Valletta and its fortifications. This highlights the historical importance of this city, recognised as a World Heritage Site by UNESCO in 1980. An artistic reinterpretation of the grid of the straight streets which characterise Valletta will serve as a colourful backdrop. This year, the Valletta Green Festival provides an opportunity not to be missed as two 400-year-old secret gardens are being opened to the public for the first time. Located in the buildings of St Catherine’s Monastery and the Archbishop’s Palace, the two gardens will be open from 9am till noon, and 4pm till 7pm. The entrance for St Catherine’s Monastery is located in St Christopher’s Street, while that of the Archbishop’s Palace is in Old Mint Street. Describing the festival, Valletta 2018 Chairman Jason Micallef said “This marriage of past and present symbolises Valletta today, a city where contemporary customs and fashions live side by side with a rich architectural and historical heritage. The Valletta Green Festival provides an opportunity to unlock Valletta’s secrets during Mother’s Day weekend. It also gives added value to an annual attraction which is growing year on year, contributing to the cultural, social and economic regeneration of Valletta”. He explained that representatives from Wasteserv, the Environment and Resources Authority (ERA), and the PARKS Directorate within his Ministry will be actively participating in this Festival. “Wasteserv will be providing information about the ‘Don’t Waste Waste’ education campaign, which was launched last month, as well as information about its pilot project on the introduction of organic recycling. Wasteserv will also have activities for children related to recycling. The ERA will be promoting land and sea biodiversity and will be providing information about protected zones in Maltese waters, among others. The PARKS Directorate will be supplying information about the LIFE+ Buskett project and the Tree 4 U campaign,” concluded Minister Herrera. The Minister for Transport and the Infrastructure Joe Mizzi said “The Valletta Green Festial is another creative project that will continue to create more awareness on the environment”. During the Valletta Green Fesitval, members from the Cleansing Directorate will be promoting the Għalfejn Tħammeġ Pajjiżek campaign. The Minister also urged the public to make use of public transport to make their way to Valletta. On Saturday 7th May, Tikka Banda sessions will be taking place from 10am till noon, while Charles and Friends will liven up St George’s Square with relaxing Blues and Jazz music from 8.30pm till 10.30pm. Valletta 2018 volunteers “Tal-Kultura” will be present throughout the festival to guide the public towards the gardens. Members of the public will be able to take a peek of the infiorata from the window of the Grandmaster’s Palace overlooking St George’s Square, against a donation to the Malta Community Chest Fund.